The town of Boiro has a population of around 19000 with an economy based around fishing, mussel harvesting, farming, textiles and increasingly tourism. It is located close to its own sheltered beach side cove facing open sea on the slopes of the "Barbanza" sierra. It is nestled in the "ria de Arousa" in the lower bays of Galicia and faces open sea. A short car journey is the best way to get from the town to either of Boiro's two beaches (although they are within walking distance). Boiro has the look of an up and coming resort that is expecting big things in the way of tourism. It has an extensive and appealing beach (with lawns behind it), a couple of beach side restaurants/bars and a good and sizable town centre with many shops and a few hotels. It appeared to us that quite a bit of development had taken place around the beach area recently with a view to making it a serious holiday resort for the future. The urbanised part of Boiro lies about 1km from the beach and is well laid out and quite large, but not terribly appealing. The walk from this area to the beach is down hill going and up hill returning - the car is the best option. Many of the inhabitants of "near by" Noia prefer the main beach of Boiro to that of "Noia's" own beach, Testal. We personally don't, but that gives you an indication of this areas increasing popularity with sun bathers. There is also a constructed foot path immediately behind the lawns backing the large beach that runs the full length of the shore line if you want a leisurely stroll. The entire beach area is clean, well laid out and child friendly, the only drawback - it faces open sea and the water is cold. 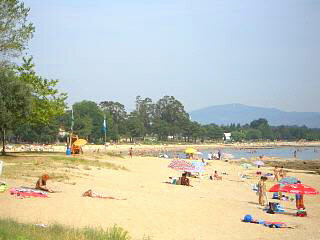 The two main beaches at Boiro are, "Barrana" (shown to the right) and "cabo de Cruz". Both have fine light sand as you near the sea. All told Boiro is an appealing town and one of many which is clearly benefiting from Galicia's new found popularity as a tourist destination. If you do visit Boiro, you will probably find it quite easy to pass away a day there, especially if you combine beach side relaxation with a walk round the shops and town center. Boiro has some archaeological remains at "O Neixon", "Cota da Morela" and "A Moureira, as well as some old churches located in the districts of "Abanqueiro" and "Cespon". Both are said to be Romanesque. A further attraction, well known in the area, is the "Torre de Goians" (tower of Goians), which is not quite as grand as it sounds, but worth a look if you are in the vacinity. If you visit Boiro, avoid the older part of town, unlike Noia it is not quaint and atmospheric, but decrepit and grotty (in our opinion)! Just like every other town in Galicia, Boiro's has festivals and the main ones commence in July. The fiesta of "Santa Eulalia" is one such celebration and another is the widely supported feast that honours the "Virgin del Carmen", the Patron Saint of fishermen. This festival takes place in "Cabo de Cruz" and has a procession at sea, in keeping with most of the regions other port towns. August sees a pilgrimage centered around a local shrine, but there is also a fiestas at "Neixon" and a feast ("San Roman el Beato) taking place during this holiday month. September sees a repeat of the festival celebrating the virgin Carmen, this time at "San Cristovo de Abanqueiro" and the final fiesta of the season happens in December when the Patron Saint of the Boiro, "Santa Eulalia" is commemorated. Boiro update - When we visited Boiro in August 2005 our previous impression of the place was some what tainted. The beaches were full to bursting and there was also some litter. Perhaps Boiro just had too many similarities to the beaches in the Costa's of southern Spain, but our view of the place diminished somewhat. 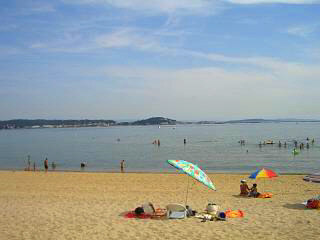 I guess if you like busy active beaches with all the amenities, Boiro is the place, but it certainly is not for us.